Delta traps are popular with growers and consultants because they are easy to maintain. (Chuck Burks, D3425-1). Adult navel orangeworm moths lay eggs on almonds and other nut crops. Larvae that hatch from the eggs feed on the nutmeat. (Peggy Greb, D1719-2). 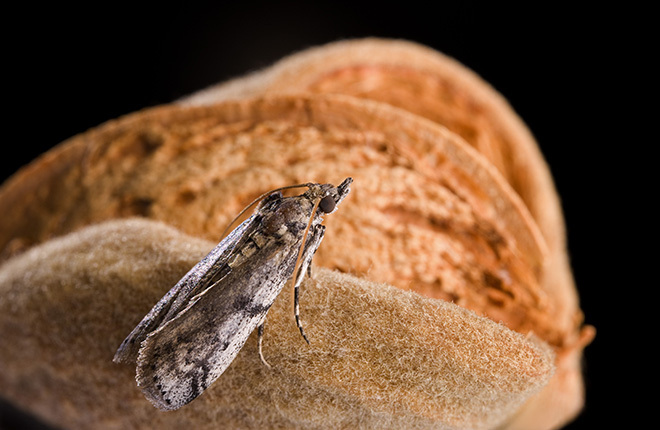 An Agricultural Research Service entomologist in California is helping the state’s almond, pistachio, and walnut growers decide whether to use a new lure to monitor their fields for navel orangeworm (NOW) infestations and to maximize its potential if they do use it. The work by Charles Burks, who is in the ARS Commodity Protection and Quality Research Unit in Parlier, is aimed at reducing insecticide use and maximizing yields on the 1.3 million acres where $7 billion worth of almonds, pistachios, and walnuts are grown each year. NOW is the number-one pest of almonds and pistachios and a major pest of walnut. 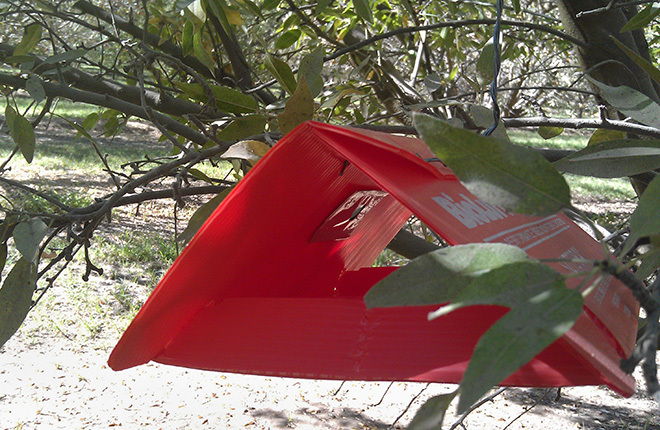 Some growers use traps supplied with almond meal to attract NOW. Known as egg traps, they require growers to count eggs deposited by females who have visited them. But counting eggs left in those traps is labor intensive and notoriously unreliable. Instead of almond meal, the new NOW BioLure uses a complicated blend of synthesized female pheromones to attract males. It can be used with a variety of traps and makes it easier for growers because they only need to count the number of captured males, not eggs, attracted to the female pheromones. The work is being funded by the growers, and Burks is working with long-time collaborator Bradley Higbee, a scientist with Paramount Farming, California’s leading almond producer. The researchers compared the number of NOW captured in commonly used wing-style traps baited with either the new lure or unmated females placed in mesh bags. The study involved experiments in almonds and pistachio fields, each running about 2 to 3 months. They replaced the female bait every 4 days to ensure there were live females. Results showed the female bait captured more insects than the lure (353 vs. 212 overall), but the lure attracted insects for 40 days. In another study, they compared capture results using three different types of traps—wing, bucket, and delta—baited with either the lure or females. They placed traps at a variety of distances from each other and counted “single night” captures and capture rates over a 4-month growing season. In traps used for an entire season, females were replaced weekly, and the lures were changed about once a month. Results showed that trap design is important. The new lure captured more insects in the wing trap than in the bucket or delta traps. But the delta trap, which is the easiest to use and the most likely to be adopted, did capture sufficient numbers. Also, the density or spacing between traps is important with the new lure. For instance, if one trap was placed every 10 acres, results showed different capture rates among different varieties of walnut trees. But there were no differences in those capture rates when one trap was placed every 50 acres. Taken together with previous studies on egg traps, the work shows that the lure does not trap as many NOW as female-baited traps, but is an improvement over the egg traps and could be an important tool in monitoring for NOW infestations. Selecting the right trap to use with the lure, and the trap density, will depend on a grower’s specific needs and priorities.—By Dennis O’Brien, Agricultural Research Service Information Staff. "Luring a Pest of Popular Nuts" was published in the May 2015 issue of AgResearch Magazine. Almond, pistachio, and walnut production worth $7 billion/year. Navel orangeworm is the number one pest of these nut crops. Traps are used to monitor and capture the pest. Trap design and lure type are important. Female pheromones or live females can be used as lures for males.